Tofu is one of those ingredients that has the ability to truly divide the crowd. I must admit that long before I went vegan, I tried several tofu dishes that left me seriously underwhelmed. 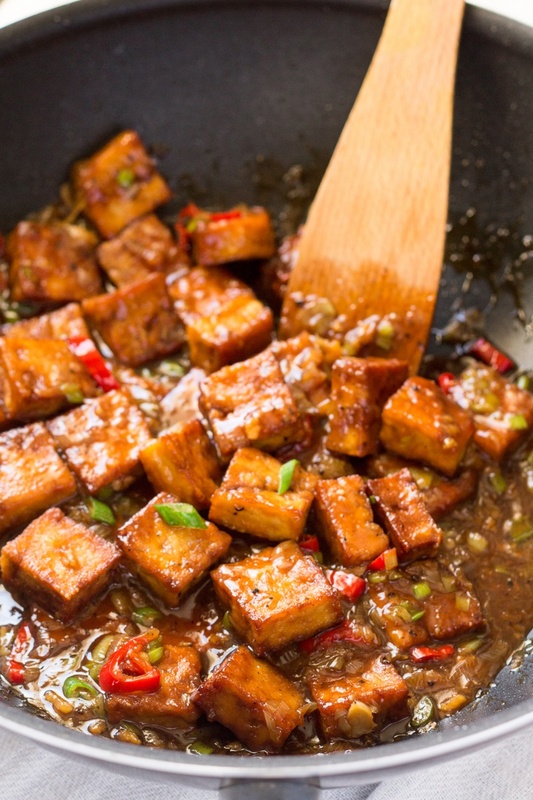 For me the tastiest way is marinating well pressed tofu in a little soy sauce, sprinkling it with cornflour (or cornstarch in the US) and frying it in a little oil until golden and beautifully crispy on the outside (yet nicely chewy on the inside). Seriously, whenever I make tofu that way, I must keep one eye on my wok and the other on Duncan, who suddenly appears by my side with his greedy little mitts ready to delve into my freshly fried tofu stack. 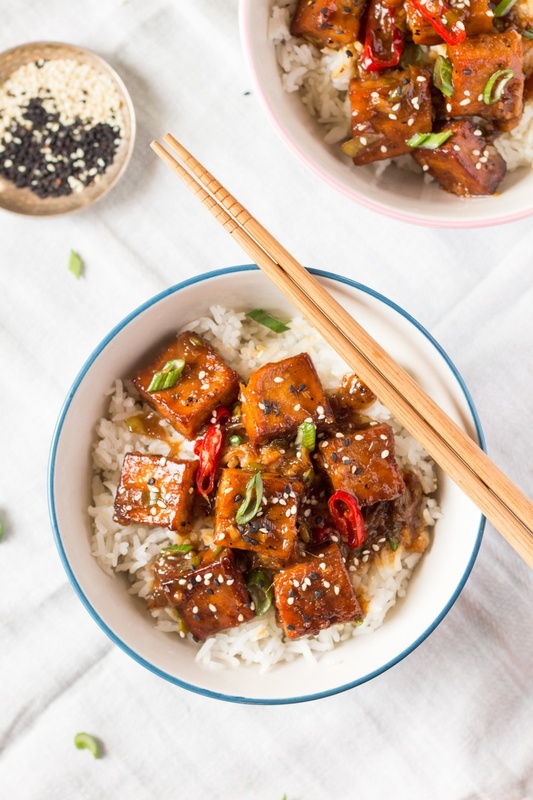 This recipe treats lovely chewy tofu pieces (you can bake them too for this recipe, see below) to a bath of deliciously aromatic black pepper sauce. Add as much pepper as you can handle, bearing in mind that chilli will also add another kick dimension. I went for just over a teaspoon and found it perfectly balanced. PS: If you make this vegan black pepper tofu, don’t forget to tag me on Instagram as @lazycatkitchen and use the #lazycatkitchen hashtag. I love seeing your takes on my recipes! Cut pressed tofu into equal size squares. Pour 2 tbsp of tamari or soy sauce over the tofu and stir a few times so that it’s marinated evenly. Only quick marination is needed as tofu will be later coated in sauce. Dust tofu in thin layer of cornflour, shaking any excess flour off. Skip this step if you prefer to bake your tofu – see next step. Heat up 3 tbsp of oil in a wok or pan. Once the oil gets hot start frying tofu in 4 batches. Watch over it and turn frequently so that it does not burn. Once first batch is golden brown, remove it from the pan and place it an a piece of kitchen towel to drain the excess oil off. Continue with the remaining 3 batches. 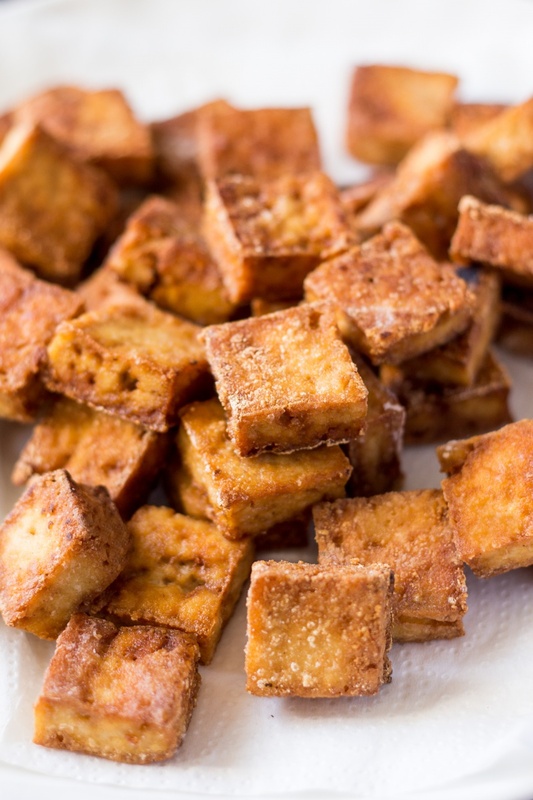 If you want to bake your tofu instead, heat up the oven to 180º C / 360º F and spread tofu pieces on a baking tray. Bake for about 20-25 minutes, flipping tofu once half way through baking. In a bowl, mix tamari (or soy sauce), rice wine vinegar and maple syrup with 6 tbsp (90 ml) of water. In a separate small bowl prepare cornflour slurry (mix 3 tsp of cornflour with 2 tbsp of water), which helps to thicken the sauce slightly. 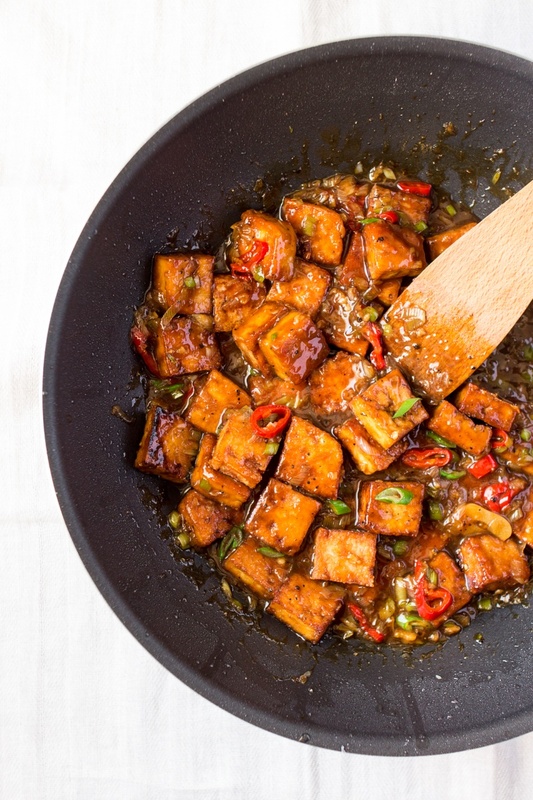 Once you finish frying the tofu, wipe the wok with a piece of kitchen towel (be careful as it will be hot) to get rid of any cornflour residue. Pour another tablespoon of oil and add sliced white parts of spring onions (save green bits as garnish) and sliced chilli. Fry gently on medium heat until they both soften, for about 5 minutes. After 5 minutes add pressed garlic cloves and grated ginger and fry for a bit stirring constantly so that they don’t burn. Push the contents of the wok to the side (or set aside on a small plate) and pour in the sauce you prepared earlier and cornflour slurry (mix well before adding as cornflour will drop to the bottom). Mix the two together and let the sauce come to the boil gently. Let the sauce bubble gently for a minute or two so that it thickens a bit. Now incorporate softened spring onions, chilli, ginger and garlic mixture back into the sauce and add ground pepper to taste. Add fried or baked tofu to the sauce to warm it up gently. Serve over a bowl of steaming hot rice. *To press the tofu, you either need a special tofu press or you can do it with a bunch of kitchen towels and a heavy weight. 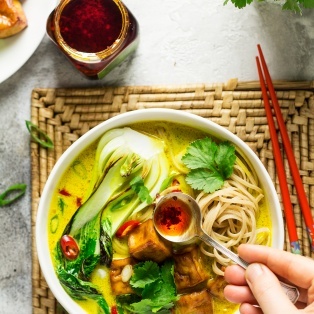 Wrap your tofu in a paper towel, place it on a plate and weigh it down with something heavy (like a can of coconut milk, for example). Once the paper towel becomes wet, change it for a new one. Repeat a few times until the paper towel stays almost dry. Pressed tofu is tastier as it absorbs flavours better. 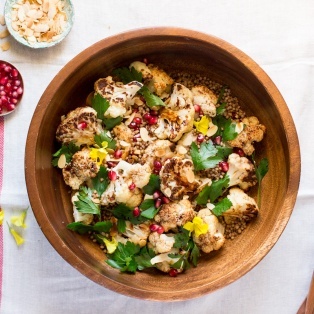 I’ve just finished eating this – it’s lovely, I highly recommend it. My other-half even enjoyed it and he isn’t normally keen on my chinese cooking attempts. I will definitely be eating this again. This is my first recipe from this site and after eating this I’m looking to see what I can cook for tea tomorrow from Lazy Cat Kitchen. Thank you for lovely feedback, Mavis! So glad you both liked my recipe. 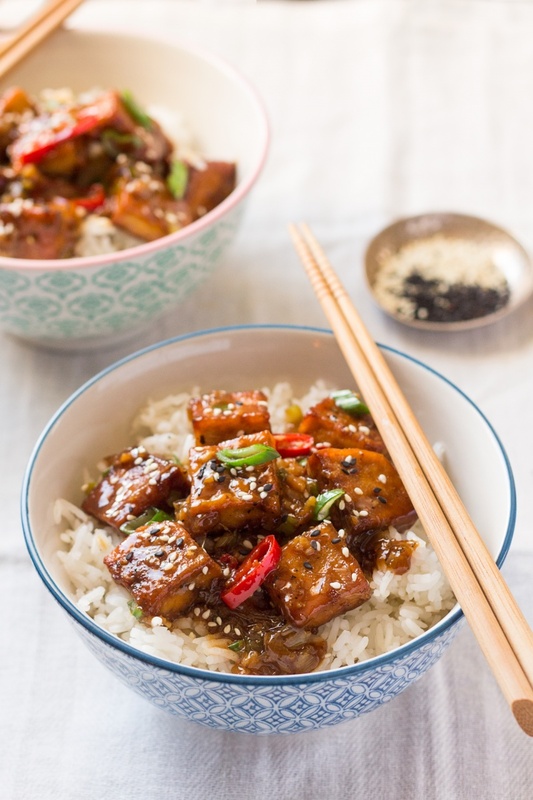 Tried my first recipe from your site – Vegan black pepper tofu – it was very yummy! I added some water since the `sauce` soon disappeared. Felt it needed something else to eat with it, so served it with an Asian kale salad and some leftover stir fried vegetables. Went down very well with the family! By the way, I think there was a mistake in the recipe – step 6 repeated what I`d already done in step 4. Thanks for your great ideas – I love looking at them! Thank your for your lovely feedback. 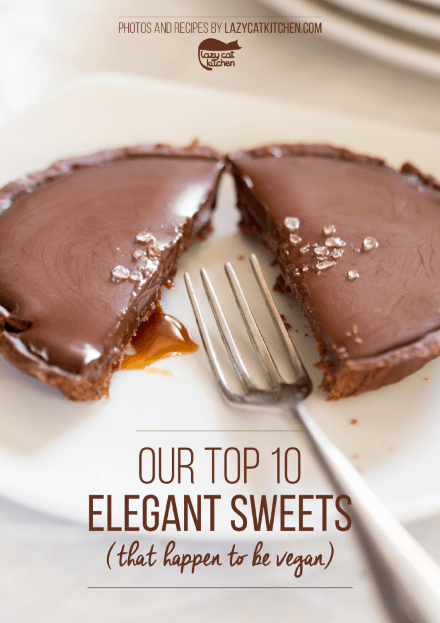 I am pleased you liked this recipe as it is one of my favourites too! Asian kale salad sounds like a yummy addition, btw! I have re-read the recipe but I cannot spot the mistake 🙁 . In step 4, you make the sauce and cornflour slurry and in step 6, you add them both to the pan and then incorporate chilli and spring onion mixture you made in step 5 back into the sauce. Would you mind telling me which bit is confusing you? I thought it was a bit different originally, but haven`t got my printed out copy any more (wrote it into my recipe book by hand!). It all seems to be correct now, so either you`ve already corrected it or I need new glasses! No worries, glad it’s all good now. I made this tonight with my Dad; we eat Black Pepper Chicken from our local Chinese Restaurant in our house all the time (I recently made the decision to transition to Vegetarian), and we all agree: THIS IS SO MUCH BETTER! We used ground ginger instead of grated, vegetable oil instead of peanut, soy sauce, brown sugar, and no sesame seeds. Will definitely be making this recipe again. We also let the oil heat up a little too long, so the tofu cooked a bit too quick. It didn’t burn, luckily- it was our first time cooking with tofu, so we made sure to keep a close eye on it. This is delicious! It’s going to be a regular around here. I replaced half of the tofu with red pepper and zucchini. That’s so awesome to hear! 🙂 Thank you! Delicious recipe! Thank you! Big hit with everyone! OHMYGOSH this is so good!!!!! Thanks for the recipe I loooooove it! Good question! I would double the sauce as it isn’t one of these dishes that has loads of sauce. It’s not dry by any means but if you are adding stuff make more sauce just in case – I doubt it will go to waste 🙂 ! Absolutely delicious!!! 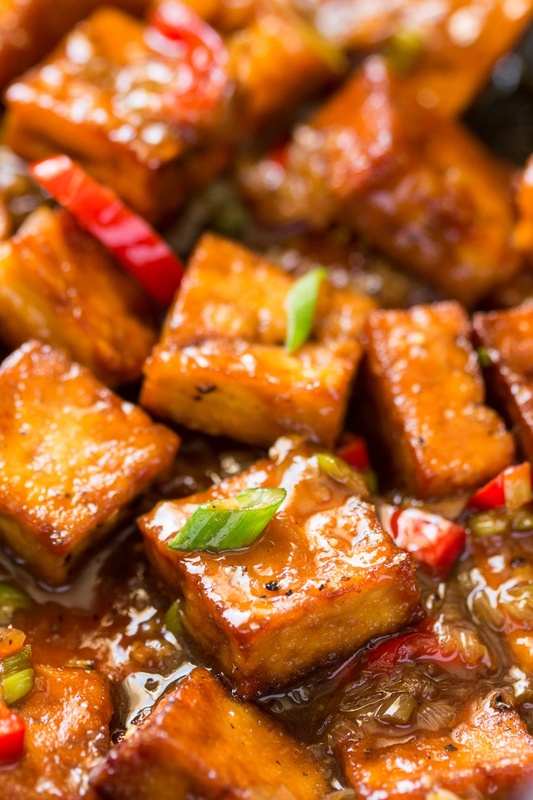 Have never cooked tofu that tasted so good thanks to your method and the sauce was also divine. Thank you! Ah this sounds so good! 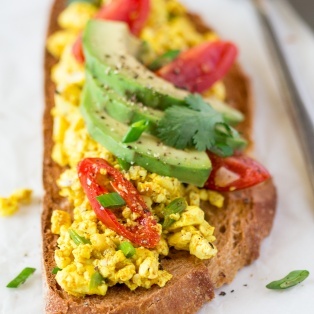 I am going to make this for my little sis she eats tofu all the time! I made this for dinner last night and it was amazing!! I am still drooling just thinking about it. I added organic veggies from my garden and used leftover jasmine rice from another night. Really worked out perfectly and the flavor and texture of the tofu was just fabulous. Great recipe, thank you! I have made Ottolenghi ‘s recipe for Blackpepper Tofu ,it is delicious but I used Food52 ‘S recipe version because it uses much less butter. Your recipe seems less labour intensive! To have very firm tofu I freeze it first and then weigh it down with a cast iron frying pan, works really well. Thanks for your thoughts. Hope you’ll try my recipe! I’ve had lots of good feedback on it so I’m confident you’ll like it too. Oh my gosh. I just made this, ate it with lightly stirfried broccoli, snowpeas, carrot and more sesame seeds (wish I’d had some bok choy or wombok!) – and this is so good that I couldn’t actually believe it. It’s amazing. It’s completely, deliciously perfect. I had to add just a weee bit of water to the sauce mix (it thickened a little too fast for me!). If anyone’s thinking of trying this, do it. It blew my mind. I just made this last night over some shirataki noodles, sauteed broccoli, sliced avocado, sliced cucumber, pickled ginger and wasabi……it’s lit. Thanks for this, and also I had to add water to the sauce as well, but that’s it. Thumbs up. 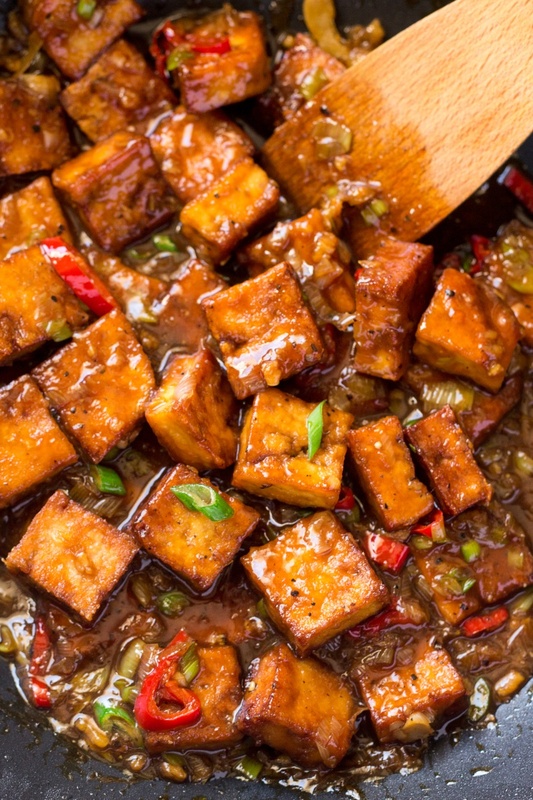 This Black Pepper Tofu dish is delicious! 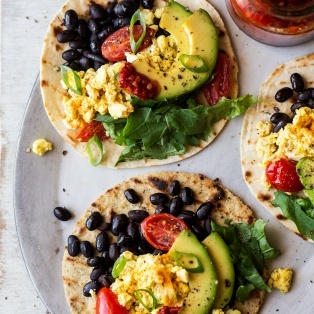 We are 1 week in on this vegan thing and we may stick with it thanks to dishes like this! Thank you, thank you, thank you! 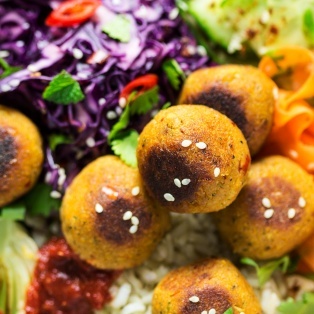 I’m still learning to eat healthy and this recipes sounds amazing but I’m worried about frying it in oil, how bad is it to do that? Does frying vs oven makes a difference in recipe flavor or taste ? This is one of my favourite meals to cook, I love it! I usually add peppers and I substitute rice vinegar for apple cider vinegar (just because I keep forgetting to buy it- it still tastes amazing). I think this recipe could be good but found the ginger flavour to be completely overwhelming. And i only added 3 tsp. If I make again I would probably reduce ginger to 1 tsp grated. I am so sorry – I realised after posting that the oil is for the sauce and not the tofu (please insert embarrassed smiley). Where does the liquid smoke go? I made this because it seems to be just like the tofu they serve in SHUK (Warsaw) and omg it is! The only thing that didnt work out is that it wasn’t as crispy as it should be and I’m not sure where I went wrong because it seemed crispy after the initial frying. Either way it was delicious! 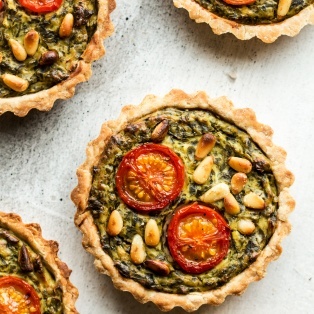 Love this recipe and cook it often – thanks! I always add aubergine to it which probes to be a tasty addition and makes it go a bit further. Hi! I’m really excited to make this recipe tonight! Would you recommend using dark or light soy sauce? Just made this for dinner for me and my boyfriend and we both it was amazing! Will definitely be making this again, thanks! Have loved this for years and just found it again to make for my 18 month old. A favourite of mine. I stir fry some broccoli in Chinese five spice (straight from the dried spice jar) and feel crazy fancy.